© ORLANDO ESTRADA/AFP/Getty Images Migrants take part in a new caravan, Monday, heading to the US with Honduran and Guatemalan national flags in Quezaltepeque, Chiquimula, Guatemala. President Donald Trump has been focusing attention on the caravan of thousands of migrants still deep in southern Mexico in an attempt to score political points two weeks before the midterm election. Neither Trump nor Pence, however, offered any proof. The Associated Press, which has several journalists with the caravan group that now is more than 7,000, reported seeing nothing to back the claim. Speaking late Tuesday to reporters at the White House, Trump admitted he had no proof and said there was “very good info” on the matter. Customs and Border Protection officials offered nothing concrete to back the claim, either. Instead they cited data showing how often criminals and people Middle East countries have been arrested trying to illegally cross the southwest border throughout the year. One source of the claim about Middle Easterners appears to be a few lines from a speech made by President Jimmy Morales Cabrera of Guatemala at the Conference on Prosperity and Security in Central America earlier this month in Washington. Context: In an interview with USA TODAY on Monday, Trump claimed that the Democrats had “something to do” with the caravans that began in Central America, but provided no evidence for his assertion. “Can you believe this, and what Democrats are allowing to be done to our Country?” Trump said Oct. 18, tweeting a video of the migrant caravan. Again, the AP and other media outlets reported that it’s unclear who is behind the caravans from Guatemala, El Salvador, and Honduras. Some have suggested the group is so large that no one person or group would be capable of organizing it. The identity of the actual organizers of the migrant caravan remains very much an unanswered question. 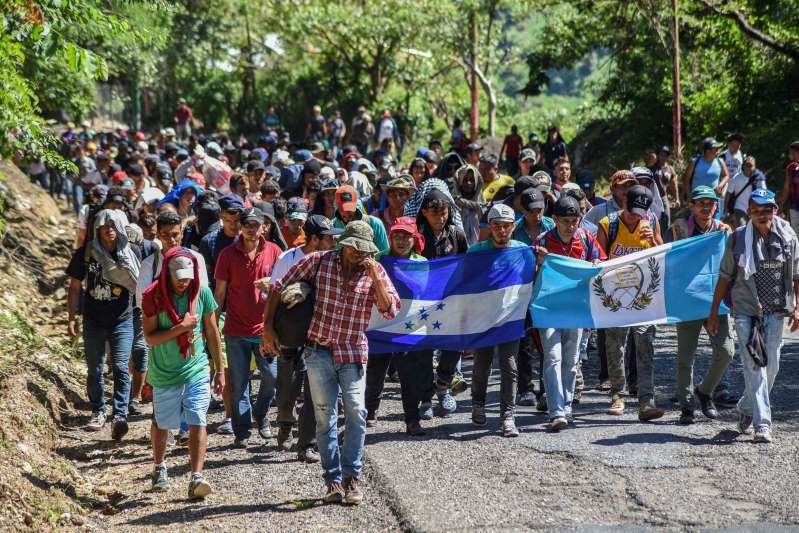 “The organizer of this caravan is number one hunger, two death,” Rodrigo Abeja, who is with Pueblo Sin Fronteras, the organization most identified by media outlets as leaders of the caravan, told USA TODAY in an interview Tuesday. The group says it is not the caravan organizer. Further, given how much political mileage Trump has gotten out of the caravan so far, it would seem unlikely that Democrats would be trying to hand him a political issue just two weeks before Election Day. Later Tuesday, the White House put out a statement accusing Democrats of allowing loopholes in immigration laws that created a "border crisis." No direct mention of the caravan was made but the implication was clear. Context: That may be true, given the sheer number of migrants. But once again Trump did not substantiate his claim that members of the MS-13 gang are among them. Otherwise, the AP said, the caravan has been overwhelmingly peaceful, receiving applause and donated food from residents of the towns they pass through en route to the U.S.-Mexico border.